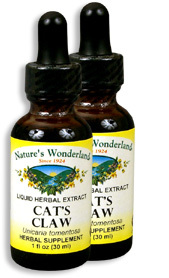 Cat's Claw Bark Liquid Extract, 1 fl oz / 30 ml each (Nature's Wonderland) - Penn Herb Co. Ltd.
Cat’s Claw is the popular Peruvian herb commonly known as Una de Gato. The prized bark supports joint flexibility & comfort, helps the body adapt to stress, and reinforces your natural defenses. Cat’s Claw is the herbalist's choice for critical immune system support. It promotes white blood cell function - a vital defense in immune health and its natural antioxidants help neutralize cell damaging free radicals. DID YOU KNOW: Cat’s Claw’s name comes from the fact that the thorns of this woody vine resemble cat’s claws? COMMON NAMES: Garbato, Paraguaya, Tambor Huasca, Toron, Una de Gato. AMOUNT PER SERVING (500mg/ml or 30 drops): Selectively Imported Cat's Claw Dry Bark (Una de Gato). OTHER INGREDIENTS: Grain Alcohol (60-70% by volume), Deionized Water. Free of: milk, dairy, egg, fish, shellfish, tree nuts, peanuts, wheat, gluten or soy. Supports immune health; digestive support; maintains gastrointestinal health; detoxifies intestinal tract; maintains joint comfort & mobility; environmental allergies.